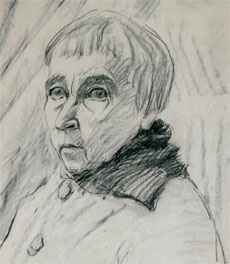 The Tretyakov Gallery opens a display of art works by Varvara Bubnova (1886-1983), a well-known Russian artist. She was born in St. Petersburg, into the noble family of Wolf, who were friends of the poet Alexander Pushkin. After graduating from the Emperor’s Academy of Arts, Bubnova started her creative career in the circle of avant garde artists in St. Petersburg. In 1913 she became a member of “The Union of the Youth” art group and participated in exhibitions together with such famous artists as Vladimir Mayakovsky, David Burlyuk, Mikhail Larionov, Natalia Goncharova and Kazimir Malevich. She translated from French the “Manifesto of the Futurists.” From 1919-1922 Bubnova lived in Moscow and worked for the Institute of Art Culture together with Vasily Kandinsky, Robert Falk, Lubov Popova, Varvara Stepanova and Alexander Rodchenko. In 1922 she went to Japan where she lived for 36 years. During that period she created mainly still-lifes and lithographs, actively participating in the artistic and cultural life there. She is still considered one of the best lithographers of that country. Crown of the 4th degree for the development of the cultural ties between Japan and the USSR. The current display is of the artist’s black and white and colour lithographs, watercolors and paintings—all in all about 70 works—from the collection of the Tretyakov Gallery and the Pushkin Museum of Fine Arts.